The System Events Log can be accessed from "System>>System Events". 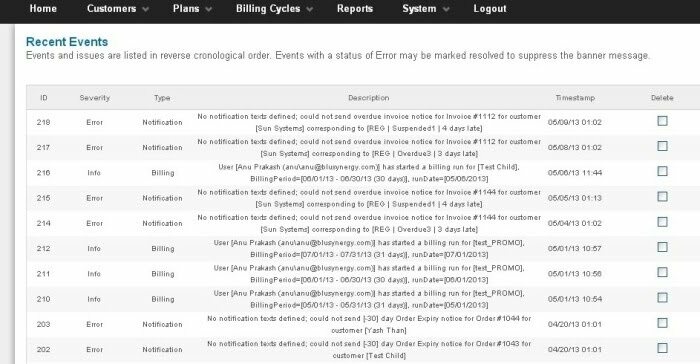 Events relating to Customer Notifications like (failed emails) and Billing (customer billing runs, Invoices approved) are logged here. Events may be logged as "Information" or as an "Error" depending on the severity. Description relating to the Type of event, the User that initiated the event and a Time stamp of the event is provided by the system. For E.g. If an email has bounced due to an invalid email address, you will be notified by the system under the Systems Log. Stay Tuned: We are working on having these error messages sent out to you in an email shortly!